Priority setting is the process through which a country’s health system establishes the drugs, interventions, and treatments it will provide to its population. Our study evaluated the priority-setting legal instruments of Brazil, Costa Rica, Chile, and Mexico to determine the extent to which each reflected the following elements: transparency, relevance, review and revision, and oversight and supervision, according to Norman Daniels’s accountability for reasonableness framework and Sarah Clark and Albert Wale’s social values framework. The elements were analyzed to determine whether priority setting, as established in each country’s legal instruments, is fair and justifiable. While all four countries fulfilled these elements to some degree, there was important variability in how they did so. This paper aims to help these countries analyze their priority-setting legal frameworks to determine which elements need to be improved to make priority setting fair and justifiable. In the quest for universal health coverage, priority setting helps publicly financed national health systems allocate limited resources in a way that meets specific public health needs. Priority setting should help ensure the financial sustainability of the health system, represent the population’s health needs, fairly and transparently allocate resources, and create relevant and accountable procedures; additionally, priority setting can help ensure equitable access to standard health services and progressive coverage. The result of priority setting can be seen in benefit packages and in positive/negative lists that outline covered health services. For priority setting, the study of law and its impact on health is relevant since legal norms establish minimum standards of accountability and tools that help us map out what a country has agreed to work on. For federal governments, norms and legislation can establish the criteria used for priority setting at the national and local levels; for central governments, priority setting establishes the criteria applicable to all territories. Normative instruments are particularly important in the context of decentralized or fragmented health systems, as they set out the basic criteria that should be considered in priority setting. The existence of norms and legislation that spell out the criteria used for priority setting and that explain its process can contribute to the process’s transparency, explicitness, and rationality. Criteria should include not only “technical” judgments, such as clinical and cost-effectiveness, but also judgments regarding social values that can make priority setting ethical and reasonable. Sarah Clark and Albert Wale have said that decisions in priority setting must be justifiable and that they involve certain process and content values that can be assessed in any health system. The content values that the authors identify are clinical effectiveness; cost-effectiveness; justice and equity; solidarity; and autonomy. The process values they identify are transparency, accountability, and participation, which are commonly associated with Norman Daniels’s accountability for reasonableness framework (A4R). Daniels has argued that since it is difficult in pluralistic societies to reach consensus on the principles of priority setting, it is better to study whether the process is fair through A4R. To establish whether the priority-setting process is fair, A4R considers the following elements: transparency concerning the reasons why a certain health input (that is, a service, treatment, or intervention) is included; relevant reasons, as judged by appropriate stakeholders, about how to meet health needs fairly; and revisable decisions through an appeals procedure that allows relevant stakeholders to raise considerations in light of new evidence or arguments. It is important to make explicit the values and principles inherent to priority setting since failing to do so can have a negative effect. The absence of explicit priority setting has caused unfavorable outcomes in many low- and middle-income countries where multiple priorities coexist alongside a constrained budget, generating implicit rationing through unfair mechanisms that produce inequities. The existence of explicit health benefit plans, of increased rights awareness among the public, and of legal instruments that outline the process and content of priority setting can improve accountability. The study of Latin America is useful in this regard, given that many countries in the region have included explicit priority setting in their legal instruments. In this paper, we argue that priority setting in some Latin American countries tends to be fair and justifiable if the legal instruments that define its process provide for certain elements specified by the A4R framework and certain values outlined by Clark and Wale. Therefore, we redefined the four elements of A4R in a way that helped us identify whether the priority-setting process reflected some of its core ideas, as well as the extent to which the elements (transparency, relevance, review and revision, and oversight and supervision) are found in legal instruments. Additionally, we redefined six social values (participation, clinical effectiveness, cost-effectiveness, equity, solidarity, and autonomy) from Clark and Wale’s framework to assess the priority-setting content in a way that allowed us to determine the extent to which they were incorporated into legal instruments. We included Clark and Wale’s values as part of A4R’s relevance element in order to achieve clarity about the concepts involved in the reasons why actors make specific decisions in priority setting. The definitions can be found in Figure 1. We studied priority setting in Brazil, Costa Rica, Chile, and Mexico. We chose these countries in order to capture similarities (they all have a constitutional right to health, as well as public and private sectors of their national health systems) and differences that represent some variability among Latin American health systems. The proposed analysis fosters an understanding of the way in which priority setting can contribute to the effective realization of the right to health. It is important to note that this type of analysis has a limitation: legal analysis cannot account for what occurs beyond the law, since there is always a gap between what the law establishes and how it is executed. Nonetheless, it offers a possible starting point for an empirical analysis that can explain what happens in a country’s specific context. This analysis does not provide a rationale for why certain requirements are included in the priority-setting norms but rather identifies the elements and values that are taken into account when deciding to include drugs, interventions, and treatments in benefit packages or positive/negative lists that outline covered health services. To assess how priority setting is regulated in a given Latin American country, it is necessary to understand the following: first, how the health system works and is organized; second, whether there are one or more types of benefit packages or lists of covered health services; and third, the different laws in which priority setting might be described. For this analysis, we consulted the available legal materials on government websites and in the literature regarding priority setting in each country. We then produced descriptive tables summarizing the main themes of the analyzed elements. Brazil has a unified universal public health system, named the SUS after its acronym in Portuguese, and a private health system, named the Supplementary Health Care System. The SUS is divided into national, state, and county levels. Three main lists identify the health inputs and services provided by the SUS: the National Relation of Essential Medicines (RENAME), the National Relation of Actions and Services in Health (RENASES), and the Protocols and Guidelines for the Comprehensive Care of Rare Diseases. The RENAME is based on the recommendations of the World Health Organization, and its purpose is to facilitate access to medicines among the entire Brazilian population. The RENASES includes all of the health services offered by the SUS. The Protocols and Guidelines for the Comprehensive Care of Rare Diseases were implemented in 2015. The National Committee for Health Technology Incorporation (CONITEC) is in charge of updating the RENAME and RENASES and creating the Protocols and Guidelines for the Comprehensive Care of Rare Diseases. Since CONITEC carries out the priority setting of these three lists in the same way, we decided to analyze them as a single process. We analyzed the process for including health inputs and services in the SUS, not the way resources are allocated between the SUS and the Supplementary Health Care System. Figure 2 describes the internal priority-setting process carried out by CONITEC, although there is also an external process that involves several agencies of the Ministry of Health. Table 1 provides a detailed definition of how the elements defined in Figure 1 were found in the consulted legal instruments. Costa Rica’s health system is divided into a private and a public sector, with the latter run by the Costa Rican Social Insurance Fund (CCSS). The CCSS is responsible for managing the public fund for pensions, as well as health insurance for workers that offers sickness and maternity benefits. The state is responsible for paying a supplementary contribution for the non-contributory population. The Central Committee of Pharmacotherapy (CCP), which is part of the CCSS, prepares and updates the Official Medicines List, Costa Rica’s health benefit package. The committee’s composition and each of its members’ and advisors’ faculties are described in its bylaws. The Official Medicines List is part of the country’s Institutional Policy of Essential Medicines and Generic Denomination, whose strategies must be framed according to the criteria of universality, equity, solidarity, compulsory, and unity. The Official Medicines List is the result of a priority-setting process carried out by the CCP. The priority-setting process is established in the CCP’s bylaws and in the regulations of the Official List of Medications. Figure 3 describes the list’s priority-setting process. Table 2 provides a detailed definition of how the elements defined in Figure 1 were found in the consulted legal instruments. Chile’s health sector comprises a private sector, represented by health insurance institutions; the public sector, represented and administered by the National Health Fund; and the army’s health services. Services such as vaccines and the treatment of tuberculosis are free to the entire population. Since its health care reform of 2005, Chile has implemented different health benefits packages. The first of these is the National Drug Formulary, which contains drugs that must be covered and is essentially offered to the entire population. However, this formulary is no longer used in practice. Its last publication occurred in 2006, and in 2013 there was a slight change to only one phrase; for this reason, we did not analyze its priority-setting process. The second health benefits package is the Plan of Explicit Health Guarantees (GES, formerly known as the Plan of Universal Access to Explicit Guarantees), which must be offered to affiliates of the National Health Fund and health insurance institutions. Finally, the third package is the Ricarte Soto Plan, which creates the Financial Protection System for High-Cost Diagnostics and Treatments, includes a set of explicit guarantees for the diagnosis and treatment of diseases considered high cost, and includes diagnostic studies and treatments for oncological, immunological, and rare diseases. The GES was created by the Ministry of Health, the Ministry of Finance, and an advisory committee. The guarantees included in the Ricarte Soto Plan are defined by different government ministries and by a citizen committee that is part of a special commission. Figures 4 and 5 describe the priority-setting processes for the GES and the Ricarte Soto Plan, respectively. Table 3 provides a detailed definition of how the elements defined in Figure 1 were found in the consulted legal instruments. In Mexico, the National Health System (NHS) is divided into a public and a private sector. The public sector comprises five providers. The providers are assigned to users depending on the type of work a person performs. Employees in the formal sector of economy are assigned to the Mexican Social Security Institute; government employees are assigned to the Institute for Social Security and Services for State Workers; employees of the public oil company Pemex are assigned to Pemex’s health services; members of the marine and armed forces are assigned to the Armed Forces Social Security Institute; and those who work in the informal sector of the economy have the option of being covered by the Popular Insurance (Seguro Popular in Spanish). All public sector providers must abide by the National Drugs Catalogue, a list created by the General Health Council that names all the drugs that have been approved for use in the NHS. The drugs that are not part of the catalogue cannot be provided in the NHS. Based on this catalogue, each of the public providers must make its own institutional catalogue using its specific priority-setting process. It is important to note that not all of the drugs in the National Drugs Catalogue are part of these institutional catalogues. In Mexico, we can identify a national priority-setting process (National Drugs Catalogue) and six different internal priority-setting processes (the Protection Fund against Catastrophic Expenses, the Universal Catalogue of Health Services, the Mexican Social Security Institute, the Institute for Social Security and Services for State Workers, Pemex, and the Armed Forces Social Security Institute). The Seguro Popular has two different catalogues: one that determines which drugs and interventions will be provided for its general population (the Universal Catalogue of Health Services), which is developed by the Seguro Popular, and one for determining coverage for catastrophic diseases (the Protection Fund against Catastrophic Expenses), which is developed by the General Health Council. It is important to note that before an orphan drug can be included in the National Drugs Catalogue, the disease that it addresses must be analyzed by a special commission that evaluates its inclusion or exclusion. Figure 6 describes the priority-setting process for the National Drugs Catalogue. Table 4 provides a detailed definition of how the elements defined in Table 1 were found in the consulted legal instruments. Each country has incorporated the selected elements into their priority-setting legal frameworks in different ways. 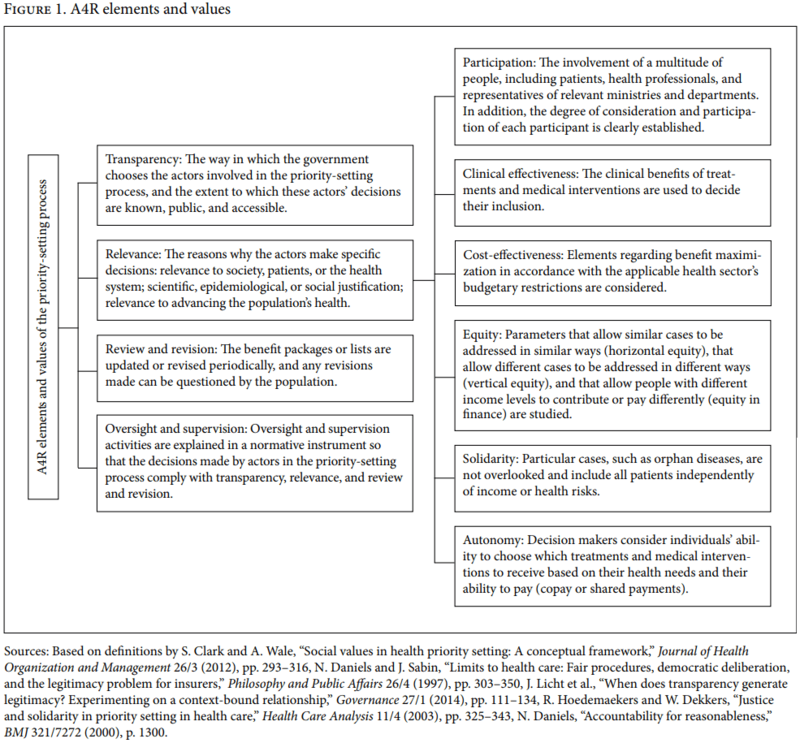 Most of the countries’ legal frameworks include the elements analyzed here, but the extent to which each health system fulfills the definitions as described in Figure 1 varies. With regard to transparency, after studying each country’s priority-setting process, we concluded that it is difficult to find the information online and that the information is not updated as required by law. The more fragmented and complicated the health system, the more onerous it is to find and understand the priority-setting process. Although we encountered barriers in finding information, we found that all of the countries’ priority-setting processes are public and, to some degree, accessible since they are established in legal instruments that are published in official diaries. It is difficult to conclude whether the processes are fully accessible and truly known by the countries’ respective populations since it is necessary to have a general knowledge of the health system and its norms to be able to search for, find, and understand these processes. Another important element of transparency is the justification for the inclusion of specific health inputs, which, in the countries analyzed here, is not easy to find. For the normative instruments in which priority setting is described, we determined that in Latin America, these instruments tend to be static or difficult to change—for example, they are often in the form of bylaws or executive decrees that must go through regulatory instances to modify their content. This is important because the priority-setting process could become outdated with respect to new technologies or methods to determine necessities. Some countries have multiple priority-setting processes, even where the country has a unified health system. This is the case for Brazil, for example, which has one priority-setting process for the RENAME, another for the RENASES, and yet another for the Protocols and Guidelines for the Comprehensive Care of Rare Diseases. In Brazil, all levels of health care planning and delivery must be prioritized not only in terms of drugs, treatments, and interventions but also in terms of the national health policy. Moreover, countries with fragmented health systems, such as Mexico, can be even more complicated. Mexico has a national priority-setting process (for the National Drugs Catalogue), a process for each subsystem (the Mexican Social Security Institute, the Institute for Social Security and Services for State Workers, the Seguro Popular, Pemex, and the Armed Forces Social Security Institute), and even separate processes for subsystems (for example, the Seguro Popular has separate processes for the Protection Fund against Catastrophic Expenses and the Universal Catalogue of Health Services). This makes even more complex the task of understanding how priority setting is performed in a specific context and how it contributes to widening gaps in coverage between the various subsystems. We found that all of the priority-setting processes analyzed here fulfill clinical and cost-effectiveness parameters. In the case of Mexico, the national priority-setting process for the National Drugs Catalogue involves a clear consideration of these elements, but this is not reflected in all of the subsystems; for example, the Institute for Social Security and Services for State Workers does not possess any of these elements, as its priority-setting process is not established in any legal instrument. Participation as a component of relevance is considered differently in each priority-setting process. In Brazil, there is a great emphasis on public participation, as the federal, state, and municipal levels are involved in health planning through national health conferences in which a more general priority setting than the one described here occurs to set national health policy. Public participation is also a central part of CONITEC’s priority-setting process. It is important to note that CONITEC comprises 13 members with a voice and vote, who are part of the Ministry of Health; there is no formal representation of other sectors. 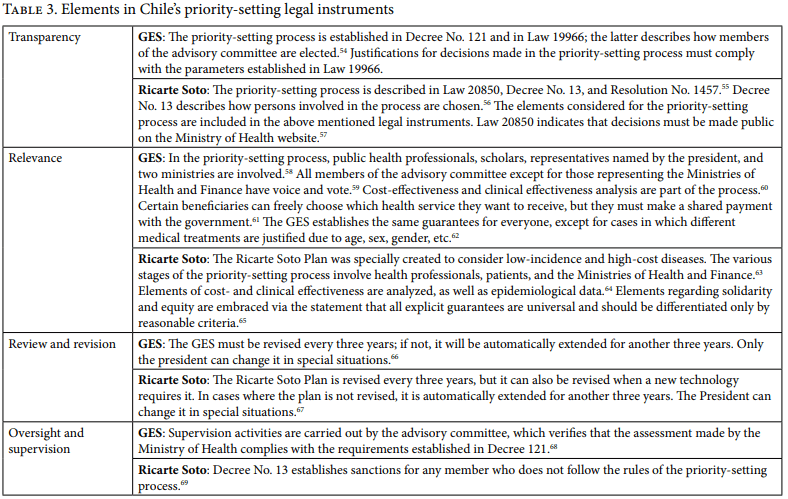 In Chile, the Ricarte Soto Plan has multiple stages in which different types of people participate; for example, patients are part of the Prioritized Recommendation Commission, but they are not part of the final decision, which involves only the Ministries of Health and Finance. For the GES, however, it is not clear how public participation is achieved. Based on our study of Costa Rica’s legal instruments, only health professionals are directly involved in priority setting, and it is not clear how citizen participation is achieved through the health councils. In Mexico, the process for the National Drugs Catalogue involves a 10-day public consultation, but this is not the case for each of the subsystem’s processes. Equity, solidarity, and autonomy are considered differently in the countries analyzed here. Brazil’s health system is based on social values such as universality and the integrality of health services. In Costa Rica, the national medication policy is guided by universality, equity, and solidarity. Additionally, solidarity is well defined since drugs that are not part of the Official Medicines List can be supplied to patients who do not respond to the list’s drugs. In Chile’s GES, legal instruments do not mention equity, but the explicit guarantees must be available for everyone, and exceptions should be justified. The fact that the Ricarte Soto Plan exists provides evidence of certain guidelines for equity and solidarity. In Mexico, equity is part of the parameters for the National Drugs Catalogue; solidarity is not clear because of the difficulties in listing and including orphan diseases and drugs. In Brazil, Costa Rica, and Mexico, there is no mention of autonomy in the priority-setting mechanisms or the existence of copays or shared payments. Chile is the only country that has parameters for autonomy. In the GES, patients can choose their treatment by making a shared payment with the government. In the Ricarte Soto Plan, there is no mention of autonomy as part of the priority-setting process; it is present only when patients who have extreme necessities are treated in health establishments that are not part of the National Health Fund, and the patient, after being stabilized, chooses to be treated there. In Brazil, there is no clear consideration for autonomy in the priority-setting process. The terms for the review and revision of the packages or lists are clearly stated in all the countries, but only Costa Rica has a process for the population to question a decision once it has been made. Oversight and supervision activities are weak in most countries. Brazil and Costa Rica do not mention them as part of their priority setting. Mexico has a slight mention of oversight and supervision activities in its normative instruments. Chile is the only country that has a more explicit mention in both of its priority-setting mechanisms. From the legal instruments analyzed, we can conclude that the different priority-setting processes are partially fair and justifiable, as they somewhat fulfill the elements. There are windows of opportunity in all of the countries to improve their legal frameworks in a way that truly complies with the elements. Undertaking such improvements can increase governmental accountability vis-à-vis publicly financed health systems. In this way, the health sector can have a clear idea of what it is bound to in terms of priority setting, and the public can know the reasons why certain inputs are included. The closer that priority-setting mechanisms get to integrating all the elements, the more that possibilities open up to increase coverage in a fair and justifiable way. We are grateful for financial support from the Mexican Association for Culture (Asociación Mexicana de Cultura). This paper is part of the project entitled “Fortalecimiento de Rectoría del Sector Salud Mediante una Efectiva Priorización de Intervenciones de Alto Costo,” number 272895 of the National Council of Science and Technology (Consejo Nacional de Ciencia y Tecnología) and the Sectoral Fund for Research in Health and Social Security (Fondo Sectorial de Investigación en Salud y Seguridad Social). We would also like to thank Alicia Yamin, Norman Daniels, Mauricio Hernández-Ávila, Rodrigo Salinas, and the anonymous reviewers for their invaluable comments and support. Sofía Charvel, Master’s in Law, PhD, is an assistant professor of law in the Academic Department of Law at the Autonomous Technological Institute, Río Hondo 1, Mexico City 01080, Mexico. Fernanda Cobo, LLM, is coordinator of the Public Health Law Program of the Academic Department of Law at the Autonomous Technological Institute, Río Hondo 1, Mexico City 01080, Mexico. Silvana Larrea, MD, is postgraduate student at the National Institute of Public Health, Mexico. Juliana Baglietto, MD, is postgraduate student at the National Institute of Public Health, Mexico. Please address correspondence to Sofía Charvel. Email: sofiach.itam@gmail.com. Copyright © 2018 Charvel, Cobo, Larrea, and Baglietto. This is an open access article distributed under the terms of the Creative Commons Attribution Non-Commercial License (http://creativecommons.org/licenses/by-nc/3.0/), which permits unrestricted non-commercial use, distribution, and reproduction in any medium, provided the original author and source are credited.
. L. Sabik and R. Lie, “Priority setting in health care: Lessons from the experiences of eight countries,” International Journal for Equity in Health 7/4 (2008), pp. 1–13; A. Glassman, K. Chaikidou, U. Giedion, et al., “Priority-setting institutions in health: Recommendations from a center for global development working group,” Global Heart 7/1 (2012), pp. 13–34; O. Norheim, “The elusive challenge of priority setting in health and health care,” Global Challenges (2017), pp. 128–129.
. Sabik and Lie (see note 1); Glassman et al. (see note 1); N. Daniels, “Accountability for reasonableness,” BMJ 321/7272 (2000), pp. 1300–1301; K. Kieslich, J. Bump, O. Frithjof, et al., “Accounting for technical, ethical, and political factors in priority setting,” Health Systems and Reform 2/1 (2016), pp. 51–60; Norheim (see note 1).
. U. Giedion, R. Bitrán, and I. Tristao, Health benefit plans in Latin America: A regional comparison (Tegucigalpa: Inter-American Development Bank, 2014).
. F. Terwindt, D. Rajan, and A. Soucat, Strategizing national health in the 21st century: A handbook (Geneva: World Health Organization, 2016).
. R. Dittrich, L. Cubillos, L. Gostin, et al., “The international right to health: What does it mean in legal practice and how can it affect priority setting for universal health coverage?” Health Systems and Reform 2/1 (2016), pp. 23–31.
. S. Clark and A. Wale, “Social values in health priority setting: A conceptual framework,” Journal of Health Organization and Management 26/3 (2012), pp. 293–316.
. Daniels (see note 2).
. J. Byskov, B.Marchal, S. Maluka, et al., “The accountability for reasonableness approach to guide priority setting in health systems within limited resources-findings from action research at district level in Kenya, Tanzania, and Zambia,” Health Research Policy and Systems 12/49 (2014), pp. 1–19; E. Makundi, L. Kapiriri, and O. Norheim, “Combining evidence and values in priority setting: Testing the balance sheet method in a low-income country,” BMC Health Services Research 7/152 (2007), pp. 1–12; S. Mshana, H. Semilu, B. Ndawi et al., “What do district health planners in Tanzania think about improving priority setting using accountability for reasonableness’?” BMC Health Services Research 7/180 (2007), pp. 1–5.
. Glassman et al. (see note 1).
. Giedion et al. (see note 3).
. J. Vega and P. Frenz, “Latin America: Priorities for universal health coverage,” Lancet 385 (2015), pp. e31–e32.
. Clark and Wale (see note 6); Daniels (see note 2); N. Daniels and J. Sabin, “Limits to health care: Fair procedures, democratic deliberation, and the legitimacy problem for insurers,” Philosophy and Public Affairs 26/4 (1997), pp. 303–350; J. de Fine Licht, D. Naurin, P. Esaiasson, et al., “When does transparency generate legitimacy? Experimenting on a context-bound relationship,” Governance 27/1 (2014), pp. 111–134; R. Hoedemaekers and W. Dekkers, “Justice and solidarity in priority setting in health care,” Health Care Analysis 11/4 (2003), pp. 325–343.
. B. Rumbold, B. Baker, O. Ferraz, et al., “Universal health coverage, priority setting, and the human right to health,” Lancet 390 (2017), pp. 712–714.
. Decreto No 7508 (2011) (Brazil, Presidência da República, Diário Oficial da União, June 28, 2011).
. Balanço CONITEC 2012 – 2014 (2014) (Brazil, Comissão Nacional de Incorporação de Tecnologias no Sus. Ministério da Saúde).
. Relação Nacional de Ações e Serviços de Saúde – Renases (2012) (Brazil, Ministério da Saúde).
. Priorização de Protocolos e Diretrizes Terapêuticas para Atenção Integral às Pessoas com Doenças Raras (2015) (Brazil, Ministério da Saúde, CONITEC).
. Aprova o Regimento Interno da Comissão Nacional de Incorporação de Tecnologias no Sistema Único de Saúde CONITEC (2012) (Brazil, Ministério da Saúde, Diário Oficial da União, Portaria No 2.009, September 13, 2012).
. Dispõe Sobre a Comissão Nacional de Incorporação de Tecnologias no Sistema Único de Saúde e Sobre o Processo Administrativo para Incorporação, Exclusão e Alteração de Tecnologias em Saúde Pelo Sistema Único de Saúde – Sus, e dá Outras Providências (2011) (Brazil, Presidência Da República, Decreto No 7.646, December 21, 2011).
. Ministério da Saúde (2012, see note 22).
. Ibid., arts. 7, 47.
. CONITEC (2015, see note 21).
. Estabelece as Diretrizes Nacionais da Relação Nacional de Medicamentos Essenciais (Rename) no Âmbito do Sistemaúnico de Saúde (Sus) (2012) (Brazil, Ministério da Saúde, Resolução No 1, Diário Oficial da União, January 17, 2012); Mensagem de Veto Vigência Altera a Lei No 8.080, de 19 de Setembro de 1990, Para Dispor Sobre a Assistência Terapêutica a Incorporação de Tecnologia em Saúde no Âmbito do Sistema Único de Saúde-Sus (2011) (Brazil, Presidência da República, Lei No 12.401, April 28, 2011), art. 22.
. Presidência da República (2011, see note 31), art. 7.
. M. Sáenz, M. Acosta, J. Musier, et al., “Sistema de salud en Costa Rica,” Salud Publica de México 53 (2013), pp. S156–S167.
. Constitución Política de Costa Rica (1949), art. 73.
. Reglamento del Seguro de Salud de la Caja Costarricense de Seguro Social (1996) (Costa Rica, Caja Costarricense de Seguro Social), art. 62.
. Lista Oficial de Medicamentos y Normativa (2014) (Costa Rica, Caja Costarricense de Seguro Social).
. Reglamento del Comité Central de Farmacoterapia de la Caja Costarricense de Seguro Social (2009) (Costa Rica, Caja Costarricense de Seguro Social).
. Caja Costarricense de Seguro Social (see note 36).
. Normativa de la Lista Oficial de Medicamentos (2016) (Costa Rica, Caja Costarricense de Seguro Social), art. 11.
. Caja Costarricense de Seguro Social (1996, see note 35), art. 6; Reglamento Juntas de Salud CCSS (2004) (Costa Rica, Junta Directiva Caja Costarricense de Seguro Social), arts. 3, 4, 7.
. Caja Costarricense de Seguro Social (1996, see note 35), art. 1.
. Caja Costarricense de Seguro Social (2016, see note 42), p. 22. Caja Costarricense de Seguro Social (2016, see note 42), art. 21.
. Giedion et al. (see note 3); Ley 20850 Crea un Sistema de Protección Financiera para Diagnósticos y Tratamientos de Alto Costo y Rinde Homenaje Póstumo a Don Luis Ricarte Soto Gallegos (2015) (Chile, Ministerio de Salud); P. Torres-Vergara, “Ley de fármacos y la necesidad de un Formulario Nacional,” El Mostrador (June 29, 2016). Available at http://www.elmostrador.cl/noticias/opinion/2016/06/29/ley-de-farmacos-y-la-necesidad-de-un-formulario-nacional/; Ministerio de Salud, Ministerio de Salud aprueba Formulario Nacional de Medicamentos (Chile: Biblioteca del Congreso Nacional de Chile, 2006).
. Ministerio de Salud, Ministerio de Salud aprueba Reglamento que establece normas para la elaboración y determinación de las Garantías Explícitas en salud a que se refiere la Ley No 19.966 (Chile: Biblioteca del Congreso Nacional de Chile, Título 1, 2005); Ministerio de Salud, Ministerio de Salud establece un régimen de Garantías en salud (Chile: Ministerio de Salud, 2004).
. Ministerio de Salud (2015, see note 51).
. Ministerio de Salud (2015, see note 51); Ministerio de Salud (2004, see note 52).
. Ministerio de Salud (2015, see note 51); Ministerio de Salud, Ministerio de Salud aprueba proceso de evaluación y priorización de diagnósticos y tratamientos de alto costo para ingresar al Sistema de Protección Financiera de la Ley No°20850 (Chile: Diario Oficial de la República de Chile, 2016); Reglamento que Establece el Proceso Destinado a Determinar los Diagnósticos y Tratamientos de Alto Costo con Sistema de Protección Financiera, según lo Establecido en los Artículos 7° y 8° de la Ley N° 20.850: Única (Chile: Ministerio de Salud, 2017).
. Ministerio de Salud (2017, see note 55), arts. 23, 33–47.
. Ministerio de Salud (2015, see note 51), arts. 7, 8.
. Ibid., arts. 2, 7.
. Ministerio de Salud, Ministerio de Salud regula el ejercicio del Derecho Constitucional a la protección de la salud y crea un régimen de prestaciones de salud (Chile: Biblioteca del Congreso Nacional de Chile, 1985), arts. 12–14; Ministerio de Salud, Ministerio de Salud crea la Superintendencia de Instituciones de Salud Previsional, dicta normas para el otorgamiento de prestaciones por ISAPRE y deroga el Decreto con Fuerza de Ley N° 3, de Salud de 1981 (Chile: Biblioteca del Congreso Nacional de Chile, 1990), art. 33.
. Ministerio de Salud (2004, see note 52), art. 2.
. Ministerio de Salud (2017, see note 55), arts. 33, 36, 40.
. Ministerio de Salud (2004, see note 52), art. 23.
. Ministerio de Salud (2017, see note 55), art. 23; Ministerio de Salud (2015, see note 51), art. 10.
. Ministerio de Salud (2005, see note 52 ), art. 19.
. Ministerio de Salud (2017, see note 55), art. 77.
. Consejo de Salubridad General, Reglamento Interior de la Comisión para el Análisis, Evaluación, Registro y Seguimiento de las Enfermedades Raras (Mexico: Diario Oficial de la Federación, 2017).
. Consejo de Salubridad General, Reglamento Interior de la Comisión Interinstitucional del Cuadro Básico y Catálogo de Insumos del Sector Salud (Mexico: Diario Oficial de la Federación, 2011), art. 4.
. Consejo de Salubridad General, Guía de evaluación de insumos para la Salud (Mexico: Comisión Interinstitucional del Cuadro Básico de Insumos del Sector Salud, 2017).
. Consejo de Salubridad General (2011, see note 71), art. 4.
. Ibid., arts. 4, 37.
. Ibid., arts. 7, 28.
. Consejo de Salubridad General (2017, see note 72), p. 21.
. Ibid., arts. 36, 47.
. Ley del Instituto de Seguridad y Servicios Sociales de los Trabajadores del Estado (Mexico: Cámara de Diputados, 2016); Acuerdo 57.1344.2014 de la Junta Directiva, relativo a la aprobación del Estatuto Orgánico del Instituto de Seguridad y Servicios Sociales de los Trabajadores del Estado (Mexico: ISSSTE, 2014); Manual de Organización General del Instituto de Seguridad y Servicios Sociales (Mexico: ISSSTE, 2017); Reglamento para el Surtimiento de Recetas y Abasto de Medicamentos del Instituto de Seguridad y Servicios Sociales de los Trabajadores del Estado (Mexico: ISSSTE, 2012).
. F. Ferri-De-Barros, Breve 16: Ethics of health resource allocation in the Brazilian publicly financed health care system (Brazil: Inter-American Development Bank, 2016).
. Ministerio de Salud (2017, see note 55), arts. 36, 40, 70.
. Caja Costarricense de Seguro Social (2016, see note 42), p. 23.